This is a favorite with my kids, who like it warm with butter and honey. Because of the honey that gets drizzled on at the table, I purposely make it not very sweet. 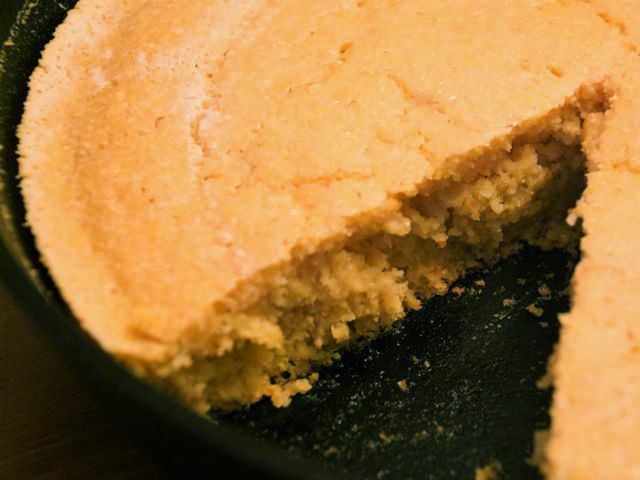 Though I most often serve it at dinner with a bowl of soup or chili, baked as muffins this cornbread also makes a nice change of pace for breakfast with fruit and a cup of cocoa. In a large bowl, whisk together the cornmeal, flour, baking powder, baking soda, and salt. In another bowl, lightly beat the eggs, then add the sugar and buttermilk, and mix together. Pour the wet ingredients into the dry, and stir long enough to mix the two together (lumps are fine). Just before baking, prepare your baking dish — either an 8-inch square pan, a 10-inch cast-iron skillet, or a 12-cup muffin tin — by putting the butter in the dish and placing it in the preheated oven. Once the butter is melted, which takes about a minute, remove the pan from the oven and brush the butter around the edges of the dish. Pour the batter into the hot pan (dividing evenly if making muffins) and bake until golden-brown and pulling away from the edges, about 20 minutes for muffins and 25 to 30 for bread. Using a cast-iron skillet makes for a nice crust; a glass dish or muffin tin yields a bread not quite as crusty (and possibly favored by the younger crowd). Be sure to check out Carrie Floyd's manifesto on surplus cooking.